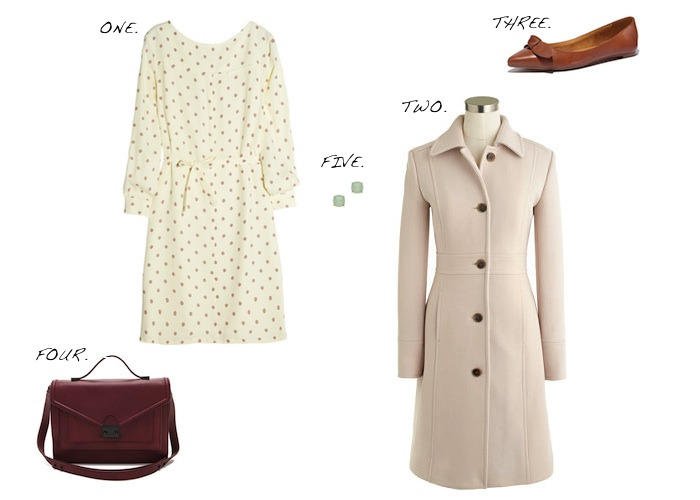 Usually I crave darker colors during the cooler months but this season I'm much more interested in neutrals. A neutral palate makes an easy transition through the seasons. You could wear something like this right through Spring. I love the sweet little burgundy print and tie waist details on this A.P.C. dress. It's so feminine and pretty. It would look perfect paired with a burgundy handbag or shoes. I know it's a thing to match your shoes to your bag but I've never abided by that rule so I most likely would not do both. I would however go with a nice tan flat like these Madewell skimmers and top it off with a cream colored coat for colder temperatures.